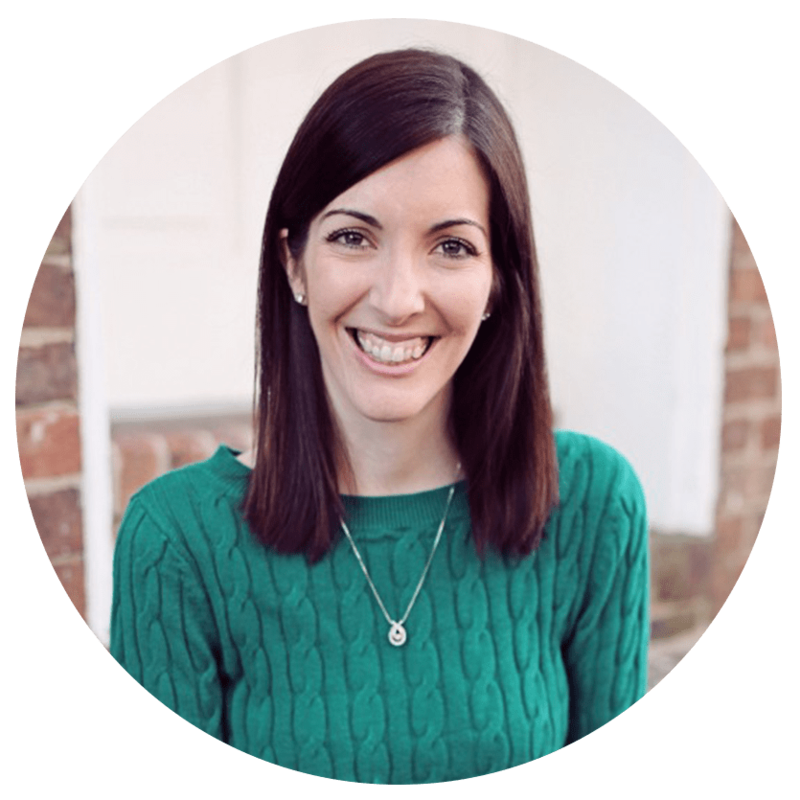 Planning a party is stressful, am I right? Now that my little girl is about to be here, I know my days of party planning will be just beginning. 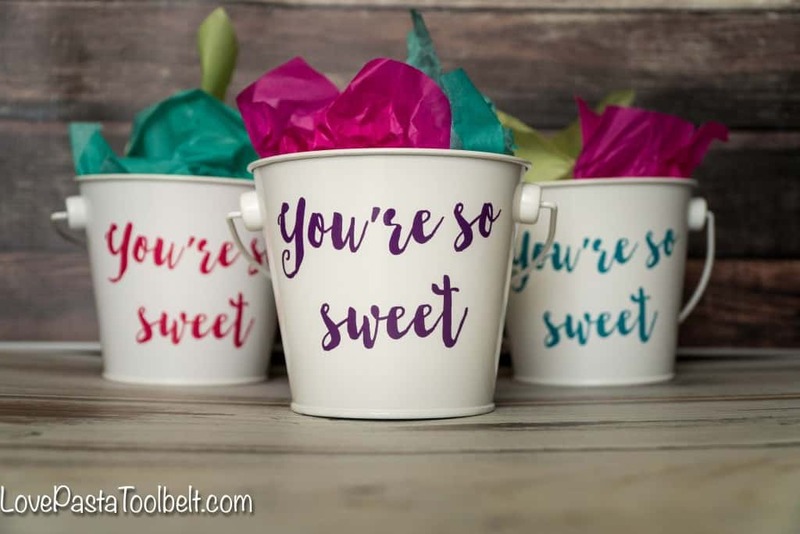 Because I’m always looking for easy party planning ideas, I wanted to share with you today these cute “You’re So Sweet” Party Favors that I made with my Silhouette. 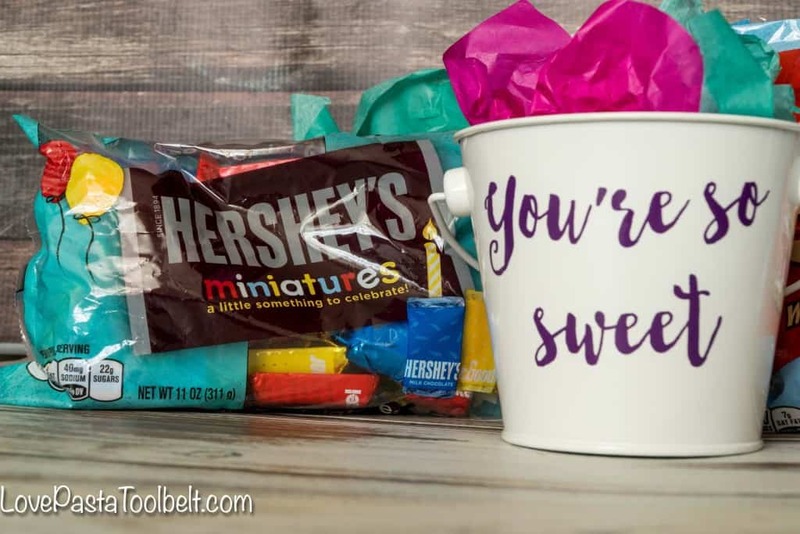 The Hershey Company has a new line of birthday products that are decked out and perfect for party planning. 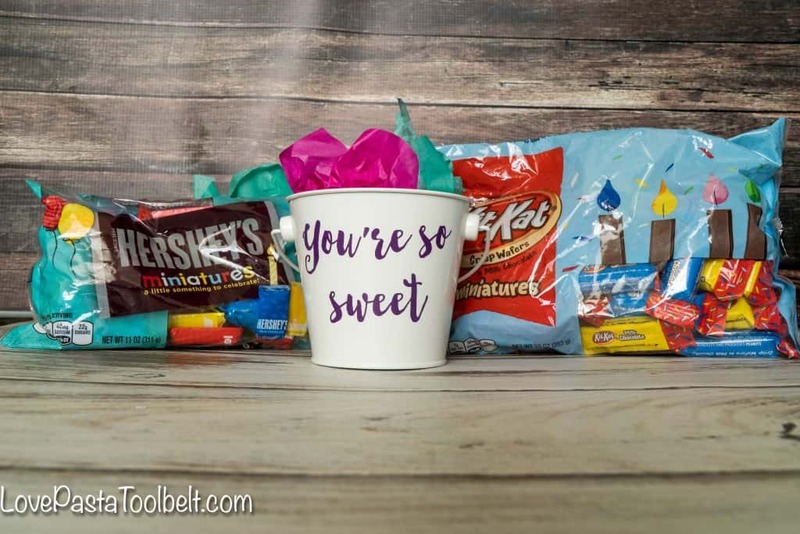 As I was brainstorming how to use these fun new birthday-themed products all I could think about was sweets for the sweet and what a fun party theme that would be. That’s when I decided to create these “You’re So Sweet” Party Favors. 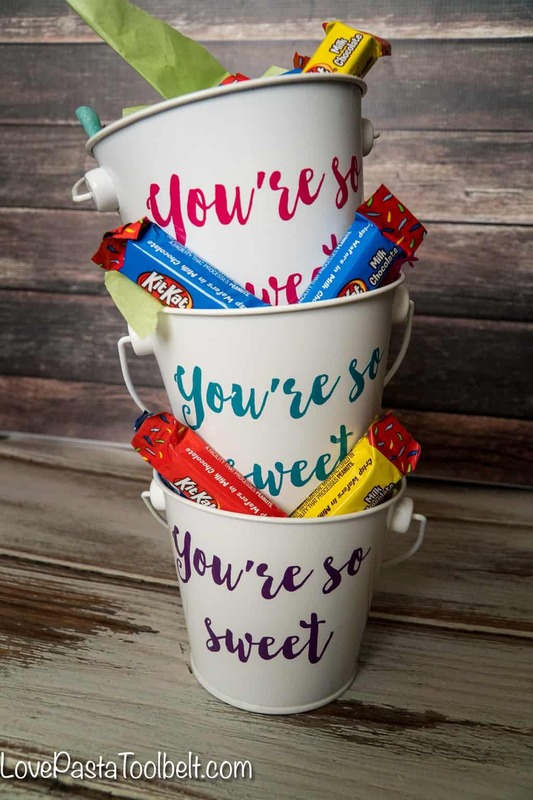 When someone takes the time to come to your party you want to thank them and tell them how sweet they are, what better way then with this cute favor and some sweet chocolate. I love the idea of using all of the Birthday parties with Hershey products offered to create a sweets for the sweet party themed. 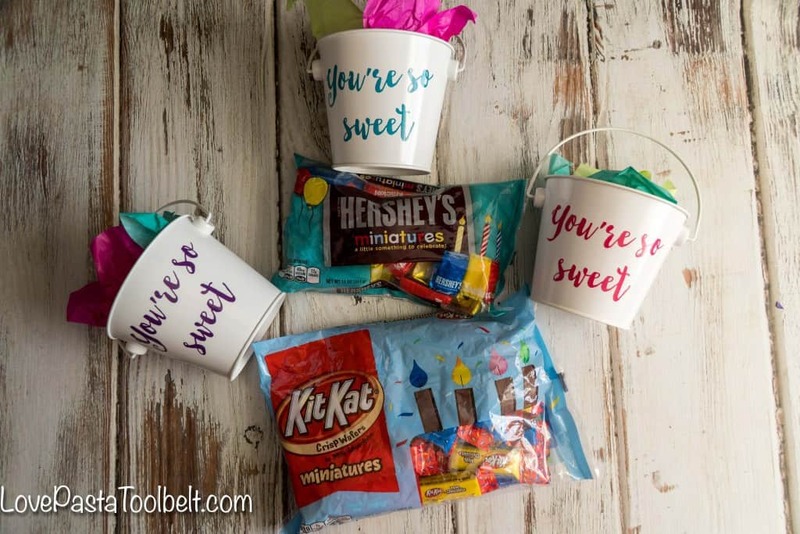 With everything from Hershey’s Kisses Chocolates, Reese’s Peanut Butter Cup Miniatures to Jolly Rancher Lollipops there are treats for everyone and setting up a fun candy bar would make a great theme for a birthday party for anyone. The great variety is sure to please any pallet. I started by picking up these cute white metal buckets at the store, you can find them for just $1 in a lot of places so head out and grab some. 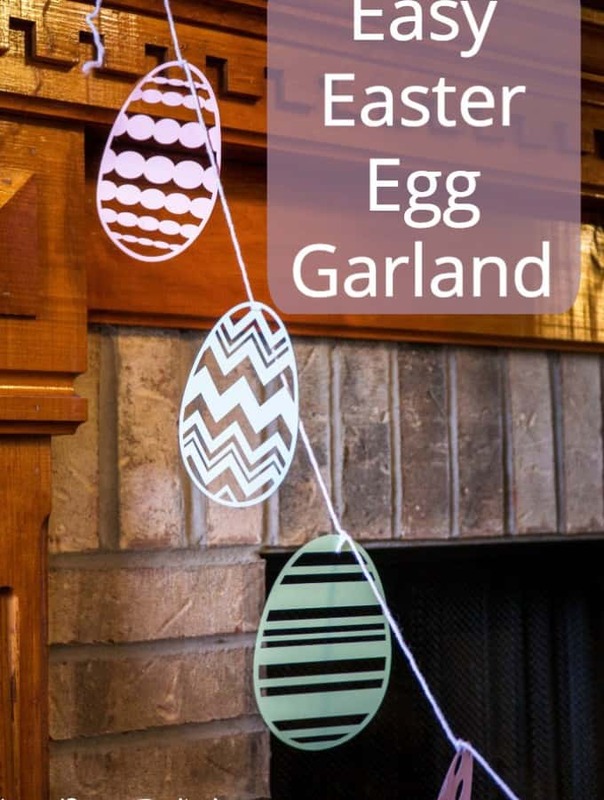 They are the perfect size for a party favor. Next, I designed my “You’re So Sweet” design in my Silhouette design studio. I picked a fun font and figured out the right size for my metal buckets. I then cut it out on vinyl, double cutting as always! 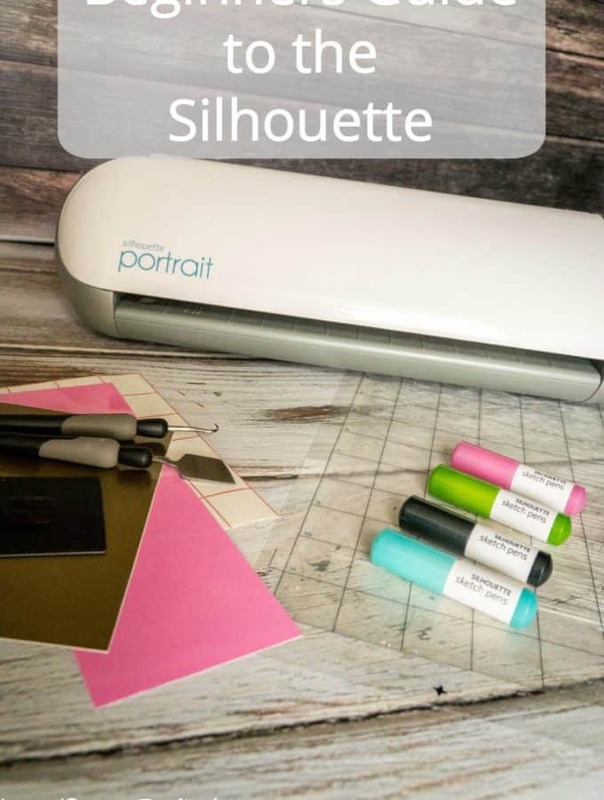 Double cutting is a great way to make the vinyl come off easier, but so easy to forget! After the design was cut I weeded it and then used my transfer paper to transfer it to the little metal buckets. 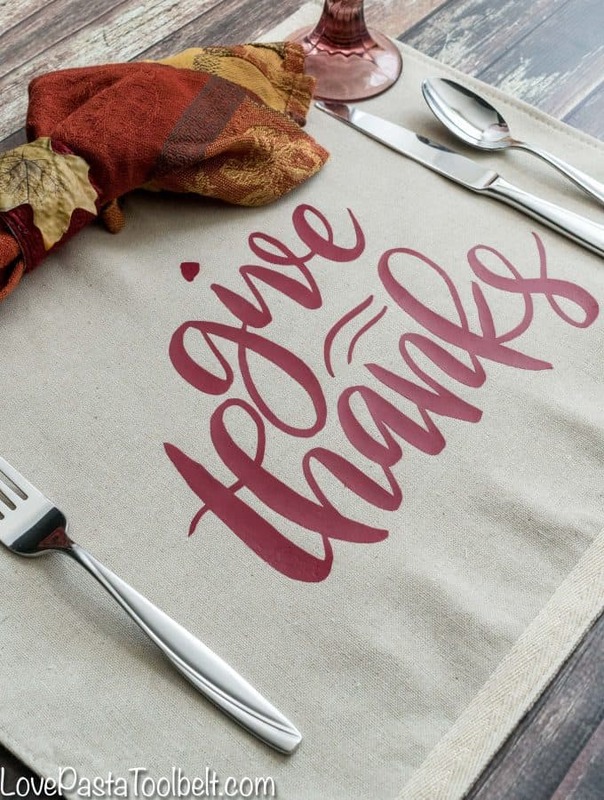 The vinyl went on really easily and I was so pleased with how quick and easy this project was. I decided to go with fun colors and used purple, turquoise and hot pink vinyl. I love that this is a totally customizable party favor and you can pick any color under the sun and match it to the color scheme of your party. 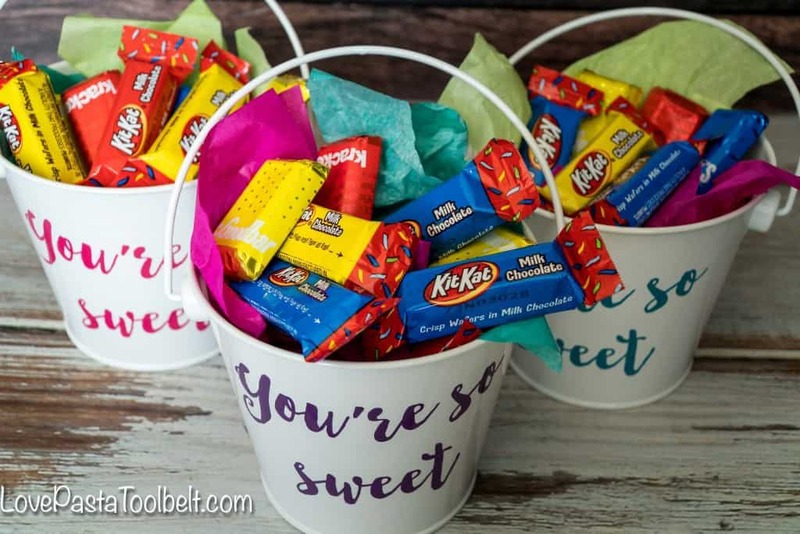 I picked up some colorful tissue paper to help brighten up my favor buckets and then filled them with the Hershey’s Assorted Miniatures and Kit Kat Miniatures. These little candies are the perfect size for a party favor and have fun, colorful packaging! 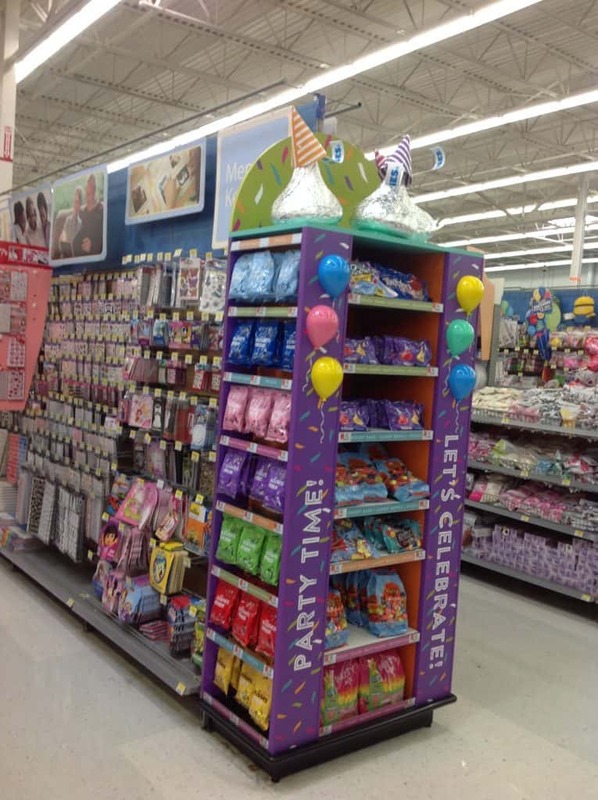 Hershey has teamed up with Walmart to debut the new birthday-themed products and you can find the displays at select Walmart’s. Just know that they will be located in the party aisles not the candy aisles. So it makes them easy to pick up when you’re there gathering all of your party supplies. So I’d love to hear how you would use these new Hershey birthday-themed products in your party planning? What are some of your favorite, simple go-to party themes? 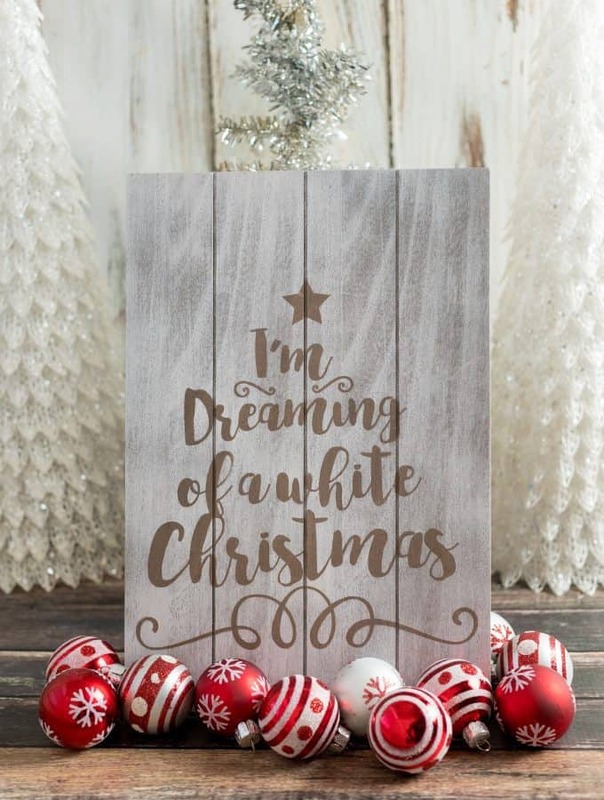 What an adorable idea! 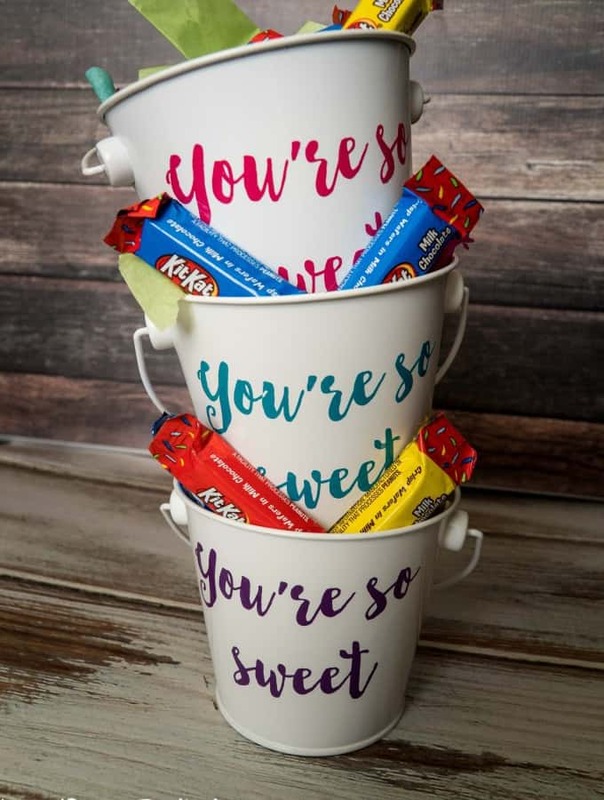 Love the little pails.